The Powder Group and Metropolitan Events are pleased to announce the dates of the second annual The Makeup Show LA! 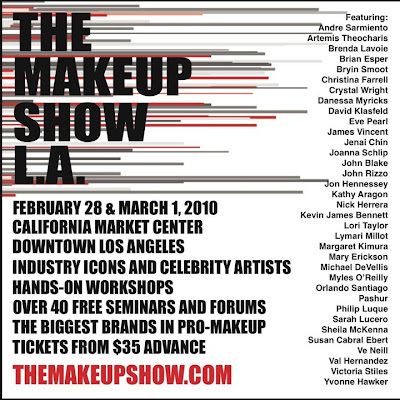 On February 28th and March 1st 2010 the makeup industry will come together to celebrate the craft of the professional makeup artist for the second time ever - at the global epicenter of entertainment and glamour - Los Angeles. Like The Makeup Show NYC and Miami, The Makeup Show LA will be a pro-artist event for everyone in every area of the makeup industry. We'll deliver the same pro-driven, artistically inspired, celebratory energy of The Makeup Show to the west coast, and bring together your top brands and inspirational artists and educators for two amazing days of community, career and craft building. It's the west coast must-attend event for anyone in the business of makeup and beauty.